New Trail Day! 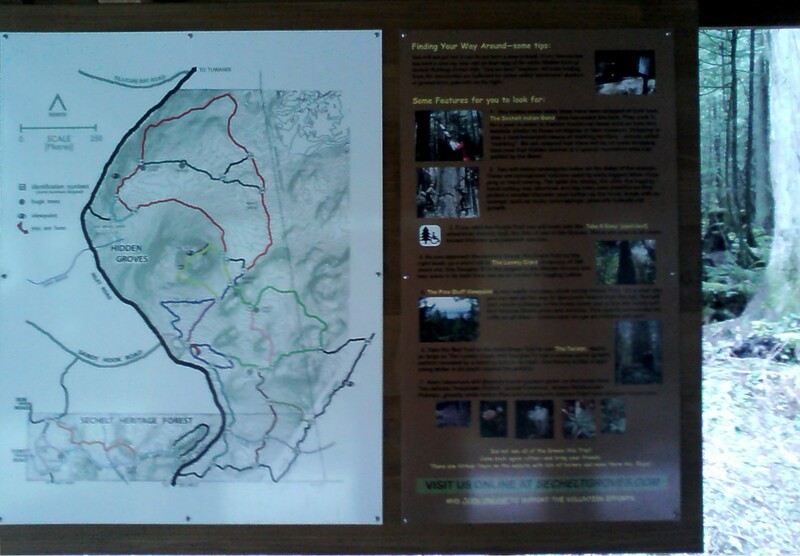 I love exploring new trails and getting to know a trail network better. Today started as one of those days where I just couldn’t get motivated to work so instead headed for a workout & re-energizing trip to the forest. I needed something challenging to get the energy flowing. I first hiked Torrent a few years ago with a much fitter friend and I remembered how exhausting yet exhilarating it was. 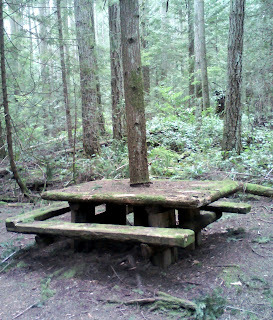 It was a whole new part of Mount Elphinstone that I hadn’t seen before. 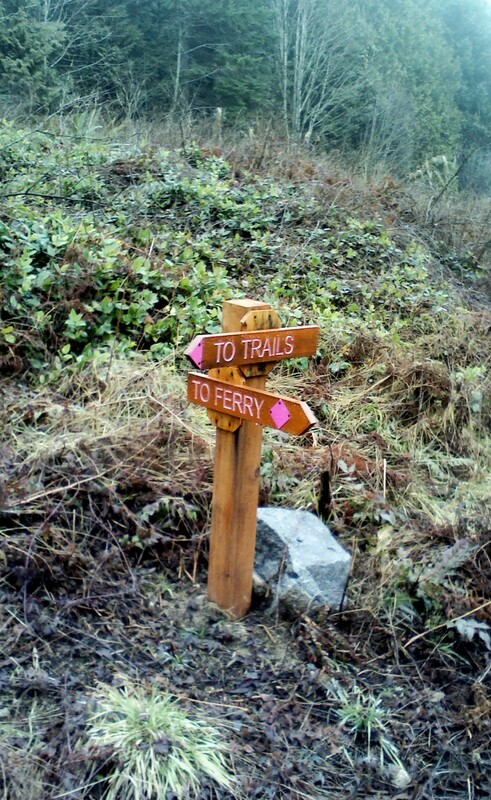 Now that I’ve explored many more trails in the area, I decided to try and find it again. 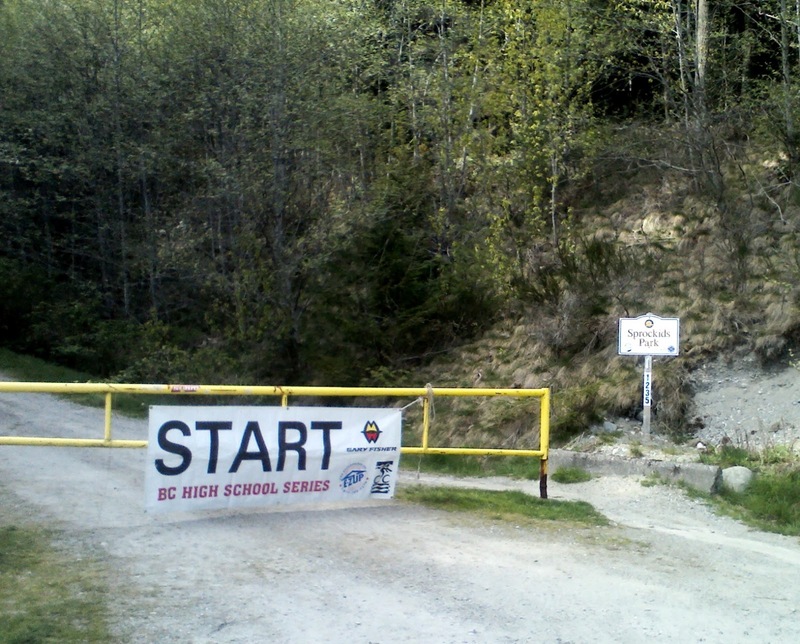 Torrent is a black diamond downhill mountain bike trail. This is a steep cardio climb, but it was also very exciting to see how much fitter I am now than the first time a couple of years ago. Before, I never would have made it without my competitive spirit to try and keep up with my friend. Today I made it up in one hour and felt great at the top. 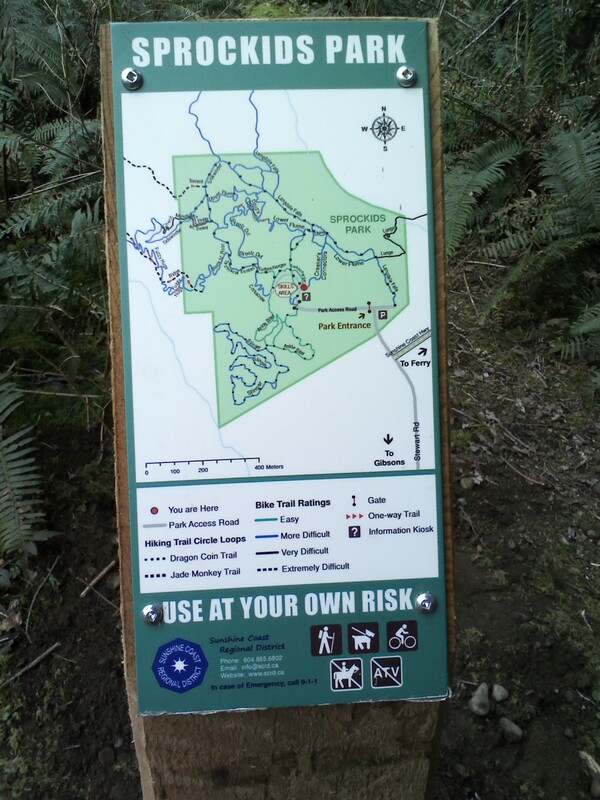 One major rule needs to be observed when hiking a trail like this…this was made for mountain bikers and they love flying down it. 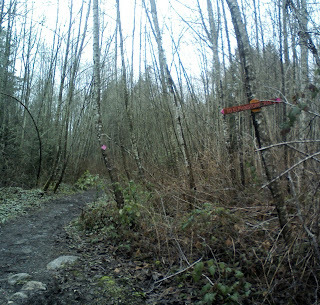 If you’re hiking, you must be alert to give way to an oncoming bike. There is nowhere for them to swerve to miss you without crashing…you must get out of the way. Today, though, I had the entire trail to myself. 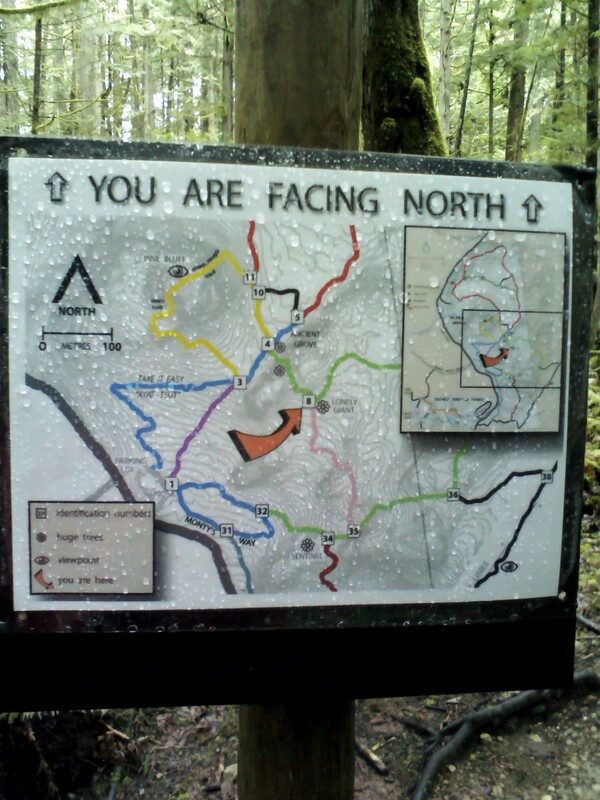 For hikers, the bottom of Torrent is within Sprockids Mountain Bike Park and is accessed from Sidewinder very near where Sidewinder breaks off from the yellow/orange trail. It heads off outside the park, but you’d never know that. When you reach the top (where mountain bikers start the trail), you’re at the intersection of Pressure Drop, Ridge, Sidewinder, and the yellow trail that becomes the Summit Trail at this point. Talk about choices! I am all about hikes with rewards at the end. There is no major viewpoint to the ocean on Torrent. The forest is much to thick. However, as you near the top you will find significant rewards. 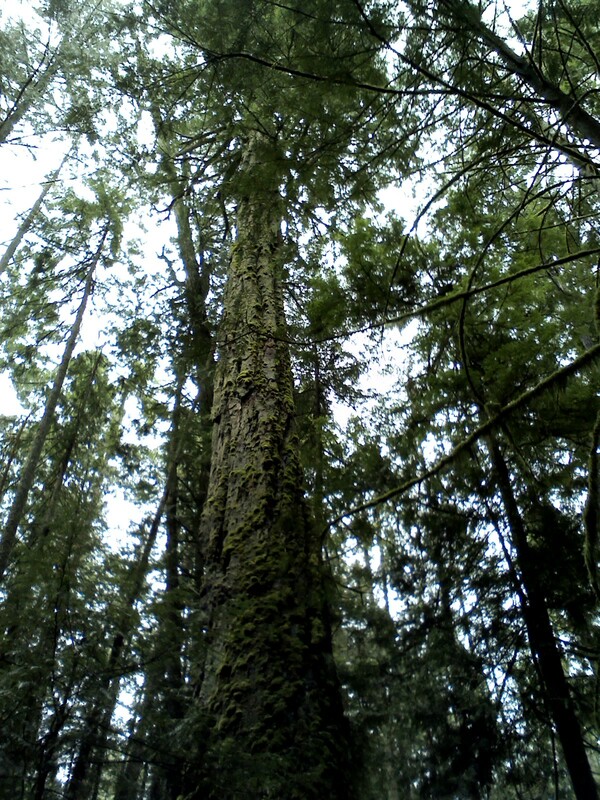 These are the trees that literally will have you saying “WOW” while you hike. 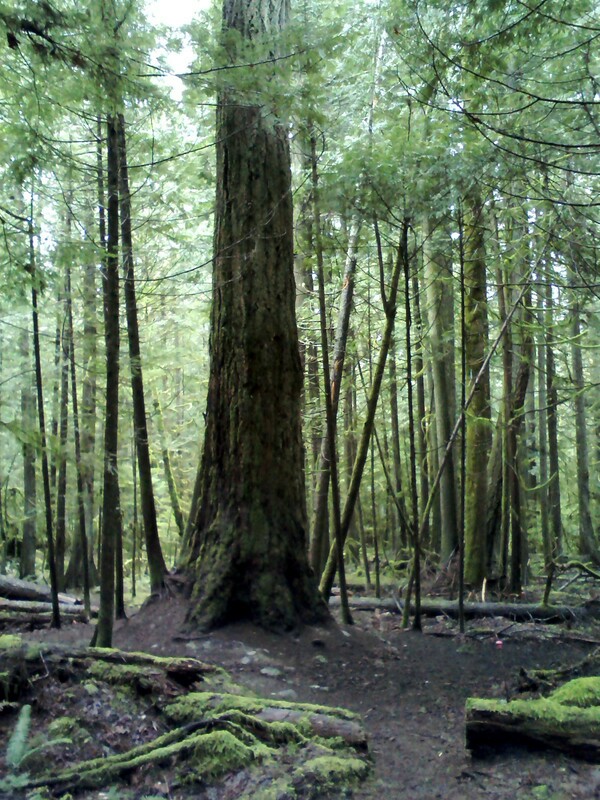 I see trees like this and I can’t imagine how massive these west coast forests must have looked when European settlers arrived 150 years ago. I love these spiral trees! 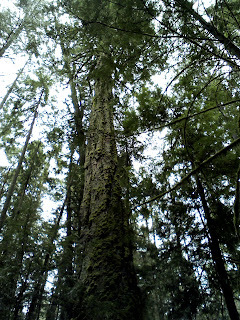 This one is so tall, I couldn’t get it in the camera frame. It’s huge! Spiral trees were left behind when the rest of the area was logged as they didn’t have ‘any value’. Boy do I value them today. 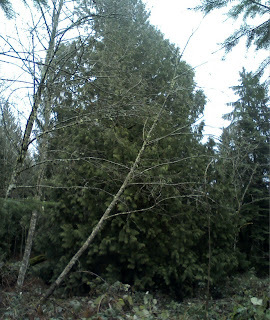 Check out this massive tree that fell years ago. There is an entire forest sprouting up out of its massive trunk. The entire length of the tree has new trees growing from it. Rather than building trail around it, this massive tree became the trail when it fell. You literally walk/ride the length of the tree. So cool! So I started this post with ‘new trail day’. At the top of Torrent I saw this piece of art. (can’t believe the photo turned out fuzzy). How do you resist a trail marked by a painting? 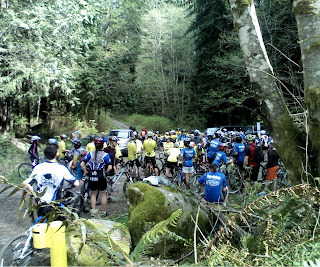 Ridge is another black diamond downhill mountain bike trail that runs just west of Torrent. Luckily, I was hiking down to explore this because an hour of steep climbing is enough for one day. Gorgeous hiking..and sure enough…it lived up to its name and I found myself on a ridge with drop offs on either side where I could here rushing water from a creek. Ridge intersects Sidewinder again and I realized I’d been at this part of the trail lots of times, but never realized that it went up at this point. 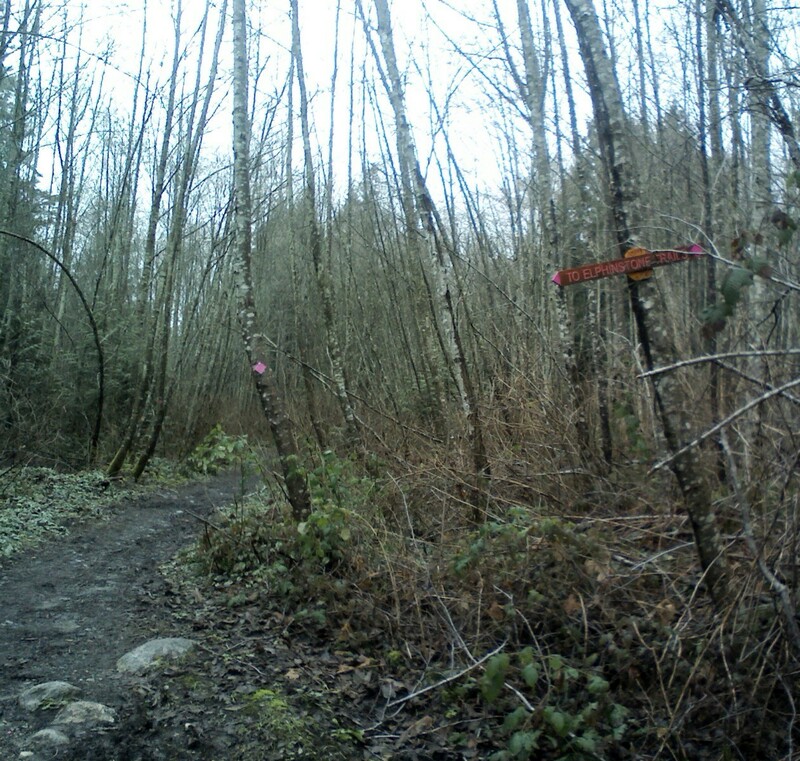 It’s another major trail junction of Sidewinder, Fuzzy Hugs and Ridge…just a short distance from the bridge over Gibsons Creek. I took Ridge further down and realized I had hiked this section many times. It’s fairly easy hiking in the lower section and connects to a lot of fun biking trails…Technical Ecstacy, Rock-n-Root, Skoolz Out. Nice easy hiking and the reward of knowing that I’m really getting to know my way around this fabulous park. One of these days I’m going to set aside the time to hike the Summit Trail. I’m told the views are spectacular. What a beautiful day! The sun beckoned this morning so I forgot about any paperwork and headed outside to enjoy. You just can’t pass up sunny January days sitting inside. I decided to follow Sunshine Coast Tourism‘s suggestion for #52weeksoftrails by heading to week #1 Francis Point Provincial Park. Francis Point is located in Pender Harbour…about 45 minutes from Arcturus Retreat. Well worth the drive! I’ve never taken the time to hike here before and I was pleasantly surprised. A perfect way to spend 15 minutes or an hour. A place for clearing your head and just taking in the view. The entire park is along the Malaspina Strait in the Pacific Ocean and the sound of waves crashing on the ancient granite rocks is a soothing constant. This is easy hiking (not a cardio day) although hiking on the rocks makes for an uneven surface in places. 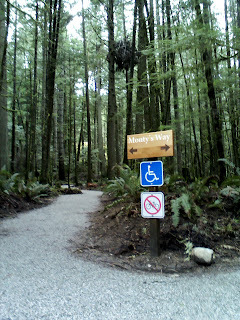 There are 2 trails in the park. Either way, you start your journey here in front of a beautiful bay. Waves were crashing in the distance and I thought, “Love to see that up close”. Sure enough, the trail hugs the coastline and before I knew it I was getting a great view of crashing waves on huge granite boulders. Choosing to start left takes you down the longer trail that probably took 20 minutes to the surprise lighthouse at the end. Hard to say on time though…I just kept taking pictures and enjoying the view. Rocky Pacific coastline is a sure sign to find arbutus trees. These are the coolest trees. They keep their leaves all year and shed their bark instead. It leaves a perfectly smooth orange texture that you won’t find anywhere else. These trees grow right out of the boulders where it is hard to imagine how any tree could take root. 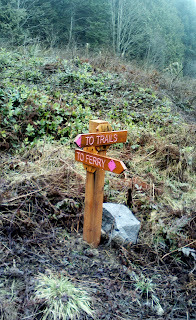 Circling back to my original starting point, I found the short trail that goes right. Just when I thought I wasn’t going to get any cardio for the day, I found the 50 or so steps that lead to an amazing viewpoint. So worth the burst of energy! I’ll definitely be back to enjoy these views. It would be very interesting to see it in different seasons…but I imagine it is always picture perfect when the sun shines bright. It’s been a very cold week here on the Sunshine Coast with daytime temperatures at or below freezing. OK, so that is still better than most of Canada, but it’s chilly for us. However, it has brought sunny crisp days that are perfect for getting outside. Today a friend and I ventured out to my happy place…the top of Soames Hill. There are 434 steps to the top so it is a bit more of a stair climber than a true forest hike, but I love it. Five minutes from Arcturus Retreat, 20 minutes of cardio and then a magical view looking down over Gibsons Landing. The granite rocks were warm in the afternoon sun and we took some time to chat and enjoy. Daily tensions disappear from this spot. What is really special is that I always feel great the rest of the day. Cardio burn over and I’m left with endorphins and a full dose of Vitamin D that carry on for hours. Here is to many more sunny winter days to get out and explore the Sunshine Coast. What’s a girl to do with a free Saturday afternoon? By all means, go hiking! This time of year I am always looking for hikes with big rewards at the end. The skies are blue, the sun is shining and being outside is the best way to spend the day. Last weekend I took the opportunity to visit Smuggler Cove Provincial Park…40 minutes from my doorstep. Smuggler Cove is an easy hike with big rewards. It is very well signed…no one is going to get lost here. The first half of the park has a number of boardwalks that wind through a marsh. Very interesting to see ducks and frogs and various creatures in this quiet wetland. Have a seat on the warm granite boulders or the memorial bench and soak up the sun and the view. I could sit and think here quietly for hours. Thormanby Island is just offshore and the southern tip of Texada Island (the largest Gulf Island) is in the distance. It is a perfect spot for dreaming…. 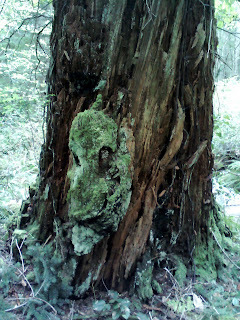 A break in the rain today, so I headed for the forest. There is a trailhead right at the end of the street which I have written about before, but it has been a while since I hiked here. Every sunny day possible…a treat in January…I’ve chosen to walk at the beach. 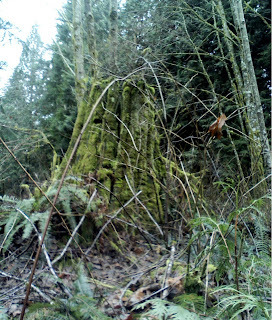 Today was more of a warm and foggy winter day, so I headed to the forest. 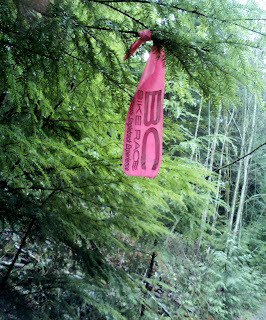 To my surprise, the amazing trail fairies have been very busy. I often avoid this trail in the rainy season as part of it becomes a stream. Someone has been adding gravel improving some of the muddier parts in a big way. 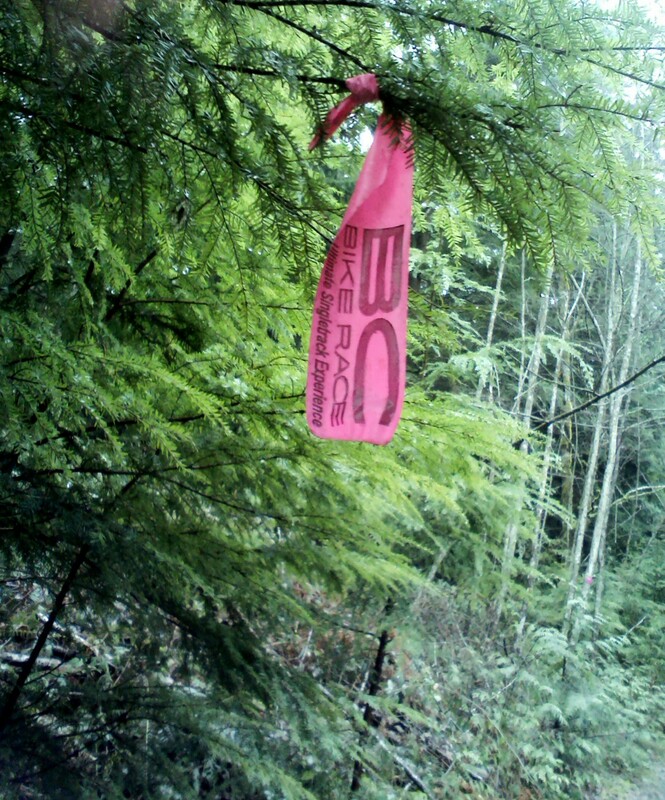 I was very surprised to see signage and trail markings to greet me…in hot pink. The trail was really in good shape, thanks to some unknown but special volunteers. 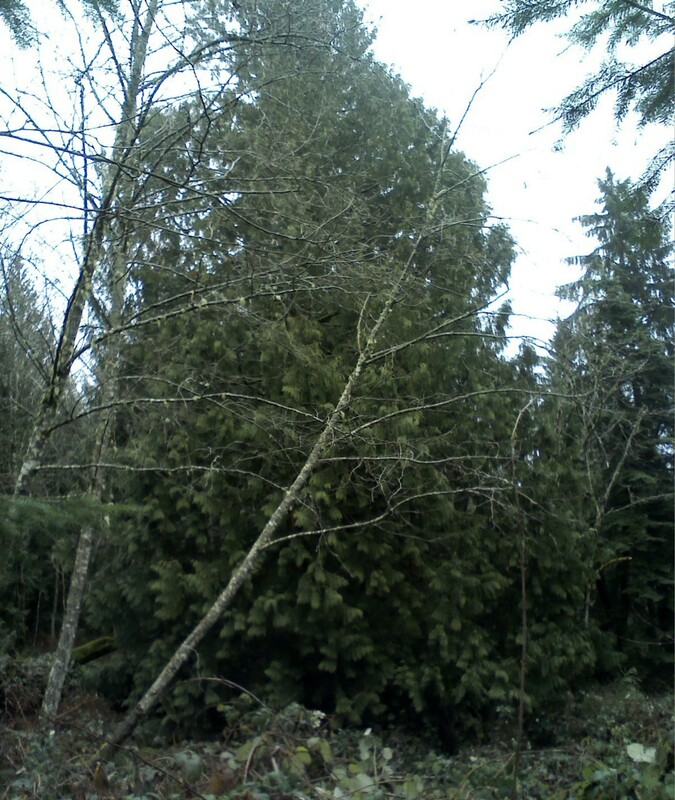 I know it’s hard to tell without a frame of reference, but this was once a huge forest giant. See the skinny trees on the right edge of the photo? 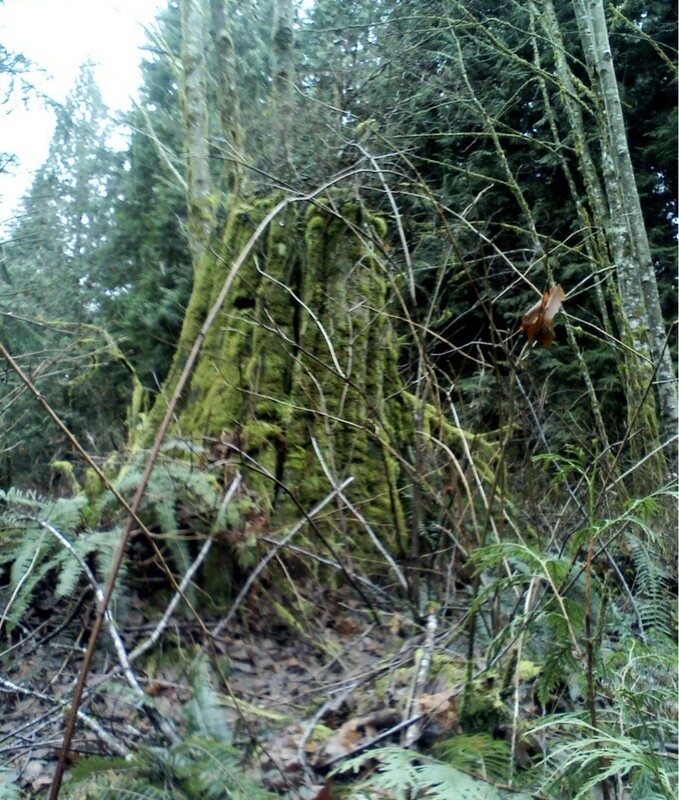 This moss covered stump is easily 3 people’s outstretched arms around. 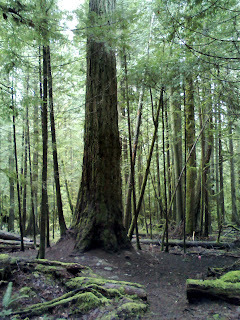 Most of the lower part of this area are young alders, but this stately giant stretches wide and proud. 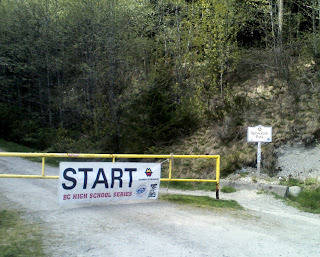 This trail connects Sprockids Mountain Bike Park to the Langdale Ferry Terminal and is the final stretch of day 5 of BC Bike Race. 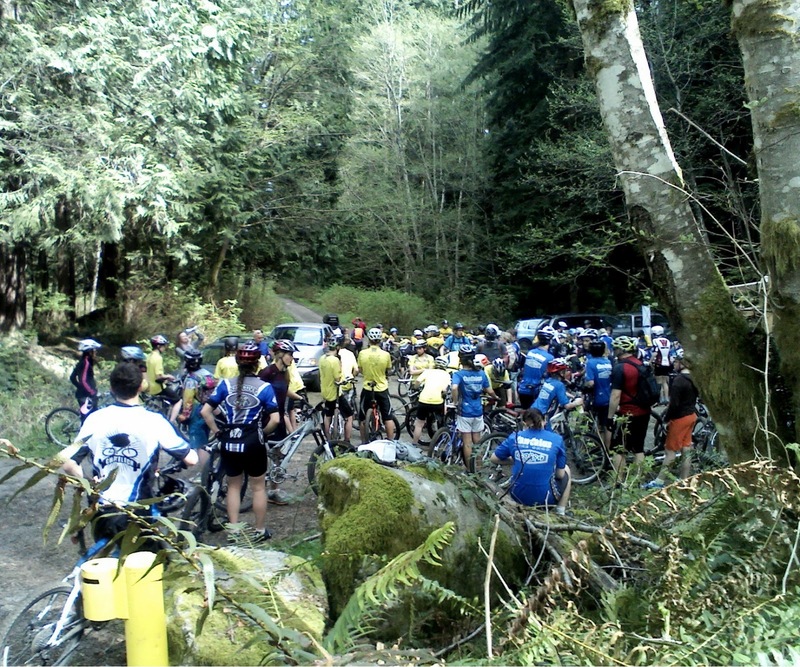 All downhill and a great finish for 500 lucky riders. 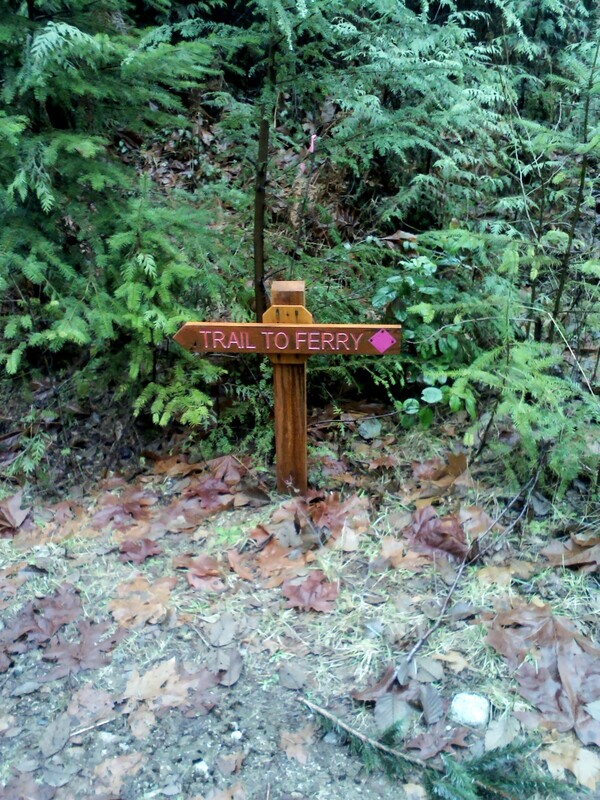 For me…its just the trail closest to home. 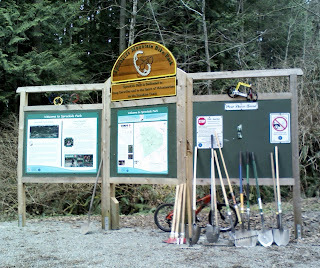 This is the sign under the hydro lines clearly showing both the way down to Langdale or the way over to the Elphinstone Trails and Sprockids Park. This is also the break between mostly young alder psuedo forest and the firs and cedars of the real forest further up the mountain. I love how green it is even in the middle of winter. Ferns are huge and everything is moist and full of life. 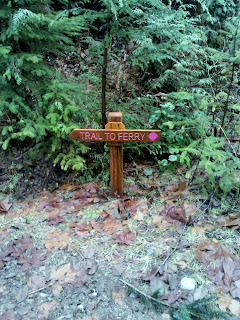 I won’t wait so long for my next visit to the Ferry Trail just beyond my doorstep.